Kayak on Open Waters of the Pacific, Snorkel, & Enjoy the Wildlife. If you are looking to get out onto the ocean for some active fun, then this is a great tour for you! 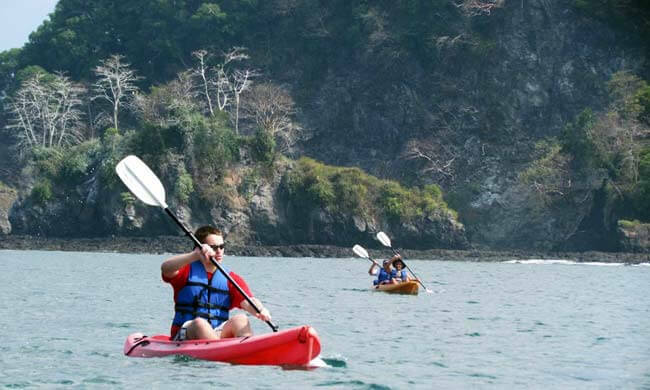 Manuel Antonio is where the ocean meets the rainforest, and sea kayaking along the coast of Manuel Antonio is a wonderful way to spend a half day out on the ocean surrounded by the abundance of nature. Your day starts when you are picked up from your hotel and driven 15 minutes to the water’s edge outside the town of Quepos (the closest town to Manuel Antonio) where your guides will give you safety instructions and get you prepared for your half day on the water! As you paddle along the Manuel Antonio coastline, you will pass small nearby islands and see birds such as Boobies and Figates nesting. The pace of kayaking will be determined by your group’s abilities and wildlife interests. After an hour of kayaking you reach the secluded Biesanz Bay where you will stop and enjoy some snorkeling around the three small but growing active coral reef systems nestled very close to the shore of the bay. 30 minutes are spent on the beach snorkeling or sunbathing in the sun! There is also time to enjoy a snack and refreshments before kayaking back to the Quepos. When you arrive back, enjoy a delicious homemade meal before heading back to your hotel. This is a challenging excursion including up to three hours of kayaking on open waters. We recommend that anyone wishing to participate in this tour be physically fit and adventurous. Your tour includes: Transportation, bilingual guides, kayaks, snorkeling equipment, lunch or dinner, snacks, refreshments. What to bring: Comfortable clothes, swimsuit, insect repellent, sunscreen, waterproof camera, hat, towel, extra change of clothes.